NEW Dergview striker Emmett McGuckin has more reason than most to look forward to Saturday’s Tennents Irish Cup clash at Coleraine. 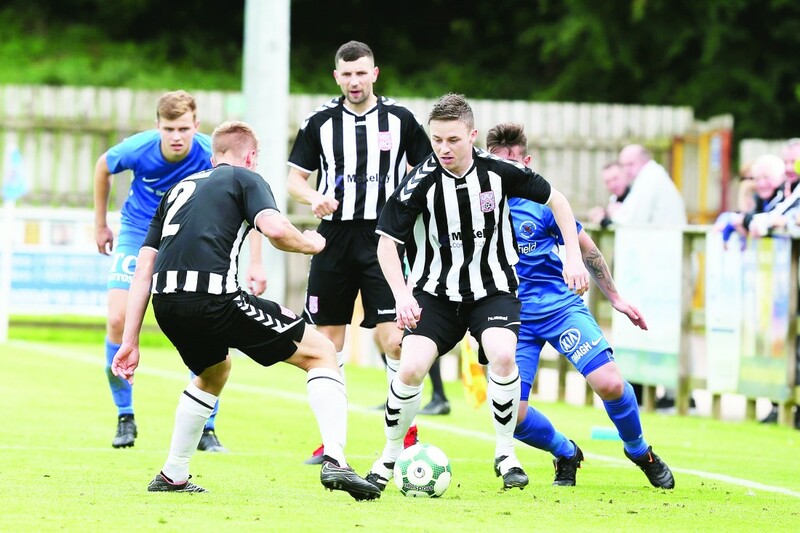 McGuckin, who scored twice in last weekend’s crucial 4-1 victory over fellow Championship strugglers, Limavady United, will be lining out against Eoin Bradley, a former team-mate of his when both were involved with the Derry GAA team. It’s also the first time the Magherafelt man has played in the sixth round of domestic football’s premier cup competition. “I’m looking forward to Saturday, it’s a massive step up but a massive opportunity for us to show what we are about,” he said. “It’s bonus territory for us to be going up against a team of the calibre of Coleraine, the current holders. “We’ll go in and give it a rattle, everyone is looking forward to it. It’ll be a great occasion for the club and great for the Castlederg community. “For me there’s an added attraction of coming up against my old playing mate Mr Bradley. “We spent six or seven years playing together with the county. Before moving to Dergview McGuckin had played his football with Magherafelt Sky Blues in the NI Intermediate League. Last season the Sky Blues were crowned champions and while the striker enjoyed every minute playing for them he said the opportunity to challenge himself to play at higher level was too much to resist. “No matter what I’m doing I want to be doing it to the best of my ability. If my ability takes me further so be it but at the minute my whole focus is trying to getting used to playing at this level. “It was a bit of challenge for me to step up from the Sky Blues. They were an excellent club but when Ivan rang me I thought it was a great opportunity to see if I could perform at that level. “It’s going to be a big challenge to get ourselves out of relegation bother but we’ll meet it head on and see how we get on in the next few weeks.